Approximately 16-1/2 inches / 42 cm wide. Look at the way this radio is styled. Despite having some very nice veneer inlays, with graining going in perpendicular directions, it's a very boxy and plain radio. 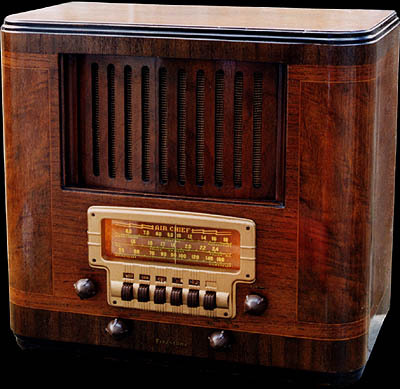 This styling trend is very evident by 1940, in radios from all manufacturers. 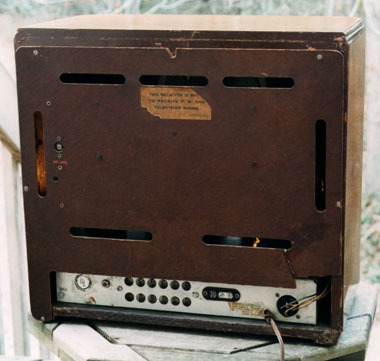 As far as many antique radio collectors are concerned, it is the beginning of the end for radio styling. Never again were radios, or consumer products in general, to have the neat shapes and awesome embellishments that were inspired by the Art Deco and Machine Age design eras. Sure, there may be interesting design quirks on some 1950s radios, but it's just not the same. Tube complement: 6SK7 RF, 6SA7 mixer, 6J5GT oscillator, 6SK7 IF, 6J5GT detector, 6SQ7 1st audio and AGC, 6F6G audio output, 5W4G rectifier. Like the S-7403-8, this one also has a fiberboard back. Note the UL label on the chassis.